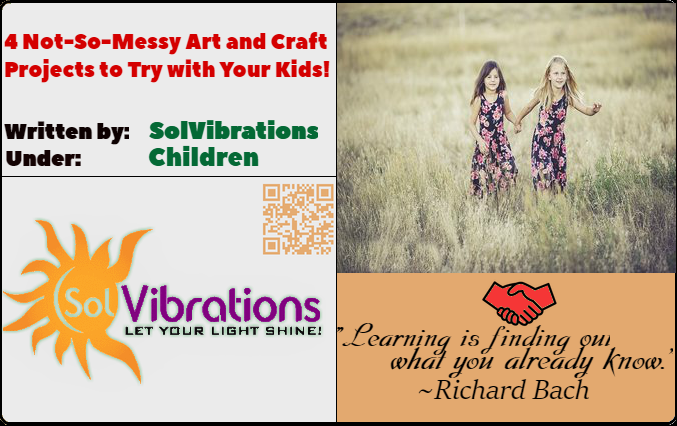 As a parent, you certainly know that fostering creativity in children helps them develop mentally, emotionally, and socially. Indulging in art and craft projects also boosts kids’ ability to analyze different situations and learn problem-solving. Sure, the mess that ensues can be frustrating to clean up. So here are 4 easy not-so-messy craft projects for your kids. Craft or Popsicle sticks can be glued together to make a holder for stationary or other items. While your kids will love using these holders for themselves, they might also fancy gifting these to their friends! Let kids paint craft sticks however they want to. Ask them to consider painting all sticks the same color or different colors if they want to create a rainbow holder. If they want to create a design on the holder like a simple chevron pattern or an underwater scene, let them paint after gluing on the sticks. Glue the paper roll onto the cardboard to form a base. Allow to dry and then snip away the extra cardboard. Apply glue on the surface of the roll and let kids affix craft sticks in place. Allow to dry before decorating with stickers, rhinestones, or ribbons. If your kids love animals, try out this easy reindeer craft with them. It’s sure to become a favorite, especially during Christmas! Have kids color paper plates with the brown paint. Allow the plates to dry. In the meantime, trace kids’ hands over the brown paper and cut them out to form antlers. Cut rectangles (4 for each reindeer) from brown paper for the legs and color one end of each with the black sketch pen for hooves. Cut out a little triangle for the tail. Cut circles from the red paper for the nose. Dab some glue on, sprinkle glitter over, and leave to dry. Cut colored paper plates in half. Use one half for the body, and cut a triangle from the other half for the face. Glue the legs and tail in place and the face on top of the body. Attach the nose and googly eyes on the face, and glue antlers on the backside. Your kids will be thrilled to run around and explore the outdoors with these amazing binoculars! Cut egg cartons through the middle on each side, leaving the raised protective part intact. Cut into rectangles with each having two peaks. Snip off the peaks to widen the opening. Cut twine or yarn (measuring about 25 inches for each pair of binoculars) and staple ends to the sides of binoculars. Let kids paint binoculars and attach embellishments as they wish. Don’t stop your kids from dirtying their hands; keep the fun and learning going with this creative idea! Cut fabric strips so that they are about 1 inch wide. If using a wooden hanger, you might want to keep the strips wider. Tape one end of a fabric strip onto a hanger and begin wrapping the fabric around the hanger. Once you get to the end of the strip, secure it with glue and colored tape. Attach another strip and continue wrapping the entire hanger. Show kids how to wrap hangers and let them try it out for themselves. Teach kids to scrunch tinfoil into small balls, then cover the balls using newspaper strips and glue. Attach one jump ring to each ball. To hold rings in place, wrap twine through them and around the balls. If you don’t want the twine to show, add a couple of extra papier-mâché layers. Allow the balls to dry for a day, after which you can let your kids paint the balls as they want. When dry, suspend the papier-mâché balls from hangers using varying lengths of ribbons. Do give these craft projects a try; your kids are sure to love them, plus you won’t have a hard time cleaning up!